At least nine people have died in a boat accident in Guinea, with about 30 people still missing, officials and residents say. 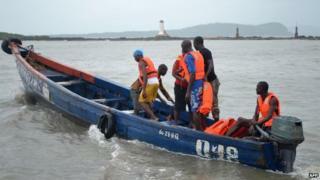 The boat capsized near the Forecariah district, in the country's south. Eighteen people on board were rescued. A local security source told AFP news agency that the boat had collided with a mining ship. Boat accidents are common off Guinea's coast, with overcrowding and poor safety standards thought to be factors. One incident in July 2012 killed at least 20 people, while another incident in August 2012 left about 30 dead. Boats are a common form of transport in the country's coastal areas. Guinea is among the west African countries currently battling an Ebola outbreak, which has killed over 4,000 people.